It will be discussed happily if one person had a new recognition in a big combined family. We will discuss about one person in solar family. Sun, Planets, their satellites and asteroids are the part of big combined family is solar family. Now one person in that is attracting the scientists. The name of him is RIA He is one of the satellites of planet Saturn. The new recognition of him is that he is having oxygen on it! Existence of life is possible on earth because of presence of Oxygen on earth. That is the reason RIA has become centre of attraction in news. No need to panic as there are no living beings on that. RIA is 150 crores kilometers away from earth and revolving around the Saturn. RIA is 5,27,000 kilometers away from Saturn and the temperature on RIA moon has the temperature of -292 degrees that means the climate is freezing cold. Total oxygen present on RIA can be accommodated in to a 70 cube room on earth. The NASA deployed space ship named Cassini discovered these details while roaming on RIA. Scientists are planning to send robot vehicles to get some more details. There are nearly 140 satellites in solar family. Like moon revolving around the earth, some satellites revolve around planets. Jupiter has the highest number of satellites that is 63. After this Saturn is in second place with 33 satellites. Uranus has 27, Neptune has 13 and Mars have 2. Pluto also has a satellite. Mercury and Venus planets do not have satellites. 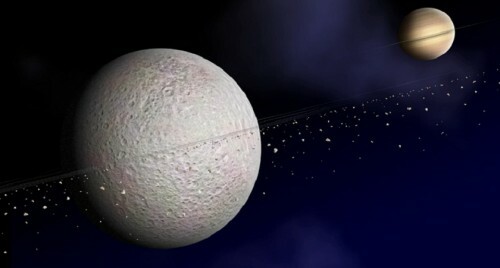 In these moons the biggest one is genemidi, which revolves round the Jupiter. This is bigger than the planet mercury. After that the bigger one is Saturn moon Titan. RIA which is having oxygen is the second biggest satellite of the Saturn.